Serendipity . 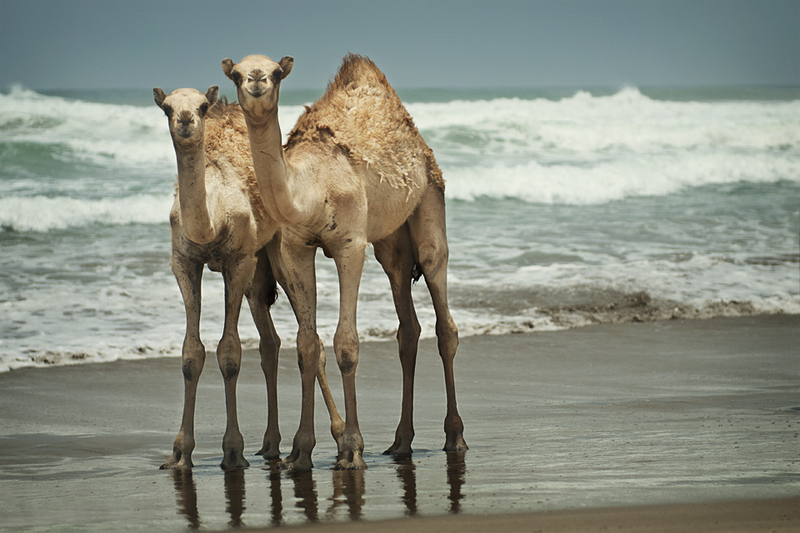 . . how often have you seen camels on a beach? It had been a long time since Horace Walpole smiled. Too long. Life for him had become as drab as the weather in dreary old England. Then on a grim winter day in 1754, while reading a Persian fairy tale, his smile returned. He wrote his longtime friend, Horace Mann, telling him of the “thrilling approach to life” he had discovered from the folk tale. The ancient tale told of three princes from the island of Ceylon who set out on a pursuit of great treasures. They never found that for which they searched, but en route they were continually surprised by delights they had never anticipated. While looking for one thing, they found another. The original name of Ceylon was Serendip, which explains the title of this story—“The Three Princes of Serendip.” From that, Walpole coined the wonderful word “serendipity.” And from then on, his most significant and valued experiences were those that happened to him while he was least expecting them. Serendipity occurs when something beautiful breaks into the monotonous and the mundane. A serendipitous life is marked by “surprisability” and spontaneity. When we lose our capacity for either, we settle into life’s ruts. We expect little and we’re seldom disappointed. Though I have walked with God for several decades, I must confess I still find much about Him incomprehensible and mysterious. But this much I know: He delights in surprising us. He dots our pilgrimage from earth to heaven with amazing serendipities. Your situation may be as hot and barren as a desert or as forlorn and meaningless as a wasteland. You may be tempted to think, “There’s no way!” when someone suggests things could change. All I ask is that you read that verse one more time and be on the lookout. God may very well be planning a serendipity in your life. and wintery wastelands for centuries. For the past three plus years I have been searching for my equivalent of “great treasures” which is employment and an income to live on—and it was almost a desperate search in the beginning because I had little funds available to me and I knew I couldn’t survive for long without an income or a miraculous intervention. My original quest was very specific—to find that job—and anything else came in a distant second. What I have found is that life is about so much more than just “earning a living” and “paying the bills.” I have gone from living in the gray world of “struggling to get by” to a totally unanticipated life of living is a world that constantly amazes me when I look beyond my own challenges and keep my eyes and heart focused on God. To say that He has taken care of me and met all of my needs during this time is, well, an understatement at the very least. What He has done is open my eyes and my heart in unimaginable and “delightful” ways that I never could have comprehended just three years ago. And, during this time of extraordinarily tight finances I have never at any time been without clothes to wear, food to eat, or a roof over my head. Yes, He does . . . if we keep our eyes and hearts open to Him and not get bogged down in the “necessities” of life or our frantic search for “more” to the point where our lives become drab, monotonous, mundane, and, well, lifeless—just going through the motions of living from the time we wake up to the time we go to bed each night. Sometimes God has to do drastic things to get our attention much like what happened to me when I lost my job and my only source of income over three years ago. But no matter how bad it looks to us at the beginning of any trial, if we remain open, humble, and pliable to what He is showing us even in the very worst of times, He will show Himself to be faithful to us in the most astoundingly amazing ways. So, you may be asking at this point in time if I still need a job. Well, you know, I just don’t know anymore. God has done some amazing things for me over these past three years and He has met and continues to meet all of my needs, and all of that has been done without me finding another job. I think, from here on out, I’ll leave my future totally in His hands and let Him decide as I just don’t want to miss out on what He is doing in this world anymore. And, if you think about it, for those of us who are Christian, whether we are “employed” or not we are always employed by God to help those less fortunate, to be open to His leading, to tell others about Jesus, and to “Trust in the Lord with all your heart and lean not on your own understanding; in all your ways acknowledge Him, and He will make your paths straight.” (Prov. 3:5-6).